Port Orchard is located just south of Bremerton on the Kitsap Peninsula, directly west of West Seattle, and linked to both the city of Seattle and Vashon Island by the Washington State Ferries. Known for its beautiful waterfront and affordable housing, this serene seaside community is a popular tourist destination, but Port Orchard waterfront real estate owners can enjoy its many delights every day of the year, rather than waiting for a vacation. They’ll also enjoy not only easy access to major cities like Seattle and Tacoma, but to Bremerton, which can be reached during weekdays, by hopping aboard one of the original Mosquito Fleet foot ferries, and on weekends, the modern Admiral Pete. For kayakers, paddlers, or boaters, having Port Orchard waterfront property means convenient access to the more than 350 miles of shoreline throughout the Kitsap Peninsula which is also popular for swimming during the warmer months of the year, beach combing, and saltwater as well as freshwater fishing. In the charming downtown waterfront, Bay Street is lined with gift and antique shops, great dining, local brews, a bakery and other popular attractions, and in the summer, it hosts a number of fun free events, including festivals and concerts. 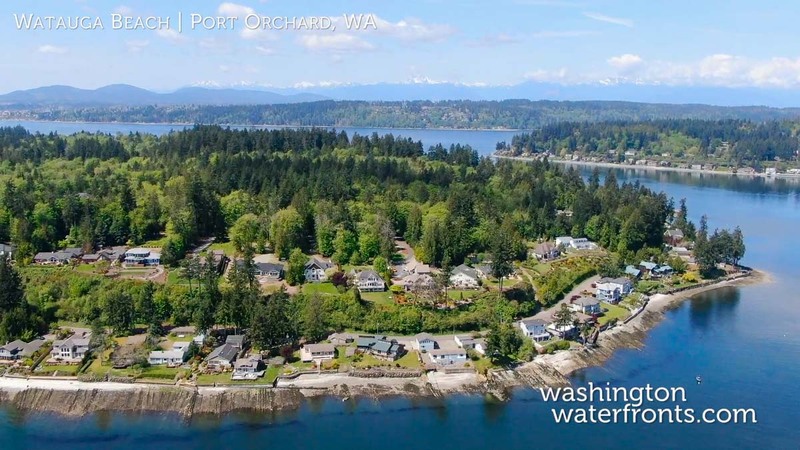 Port Orchard waterfront real estate not only means easy access to Seattle, connected to the city by ferry, but it’s one of the best values in the entire Puget Sound, making dreams of waterfront property that much easier to accomplish. Whether you’re looking for a newly constructed home close to downtown with spectacular mountain and water views, a modest home with the opportunity to remodel on the waterfront, or a lavish estate with panoramic views of the ferry passage, Bainbridge Island and Seattle with low bank waterfront, Port Orchard waterfront properties offer it all and then some. Take advantage of our industry-leading tools to make your property search as easy as possible and be sure to register for a FREE account so that you can receive email alerts whenever new Port Orchard waterfront real estate for sale hits the market. If you're seeking to sell your Port Orchard waterfront property, contact our Waterfront Specialists directly for a comprehensive listing analysis and to learn more about the cutting-edge marketing strategies we'll use to sell your home quickly for top dollar!